In the “Flashpoint” world of Batman, the three issue miniseries “Batman Knight of Vengeance” alters the classic story of Bruce Wayne becoming Batman. Within this world, Bruce’s parents, Thomas and Martha Wayne, have survived Joe Chill’s mugging and young Bruce dies in their stead. Writer Brian Azzarello, artist Eduardo Risso, and colorist Patricia Mulvihill have crafted a spare, harrowing tale of how Thomas and Martha react to their son being murdered. Thomas has become Batman and Martha has gone insane. Innocence has been shattered for both, with unbridled vengeance replacing any possibility of reconciliation with the death of Bruce. With their humanity being sacrificed, the possibility of warm human contact has been squelched. Azzarello highlights the lengths Thomas will go to in order to battle crime in Gotham City. 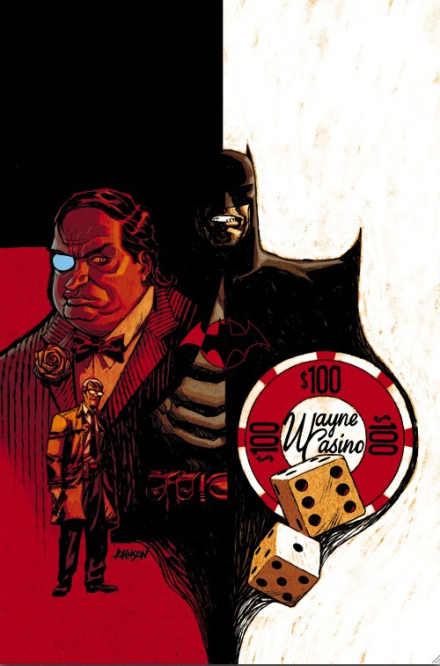 In a unique twist, Thomas opens Wayne Casino in order to draw the criminal element to him while Oswald Cobblepot serves as his meek assistant. In this world, Wayne and Chief James Gordon have convinced Mayor Harvey Dent to privatize the police force, leaving the cleaning up of crime left mainly to Wayne and Gordon. Wayne carries a burden that no ordinary human can carry and does it without moral and physical help. At one point in the story, Batman asks Gordon if Gordon could change the world, would he? Gordon answers, “That’s what I signed up for.” Thomas has signed up for the same mission as Gordon but the Dark Knight has unleashed a violent, deadly, and retributive vengeance that only begets more violence. Unlike the Bruce Wayne Batman, this Batman has no qualms about killing his enemies, like Killer Croc. The villain of the story, which will go unnamed in this review, declares that a person will go “crazy” if one loses either “joy or fear” or both. The theme of vengeance and losing one’s humanity resonates in Azzarello’s words. Because of how Thomas has reacted the way he has to Bruce’s death, he has lost joy and fear. He is willing to do anything in order to wreak vengeance. The sparse dialogue in the miniseries, which is a hallmark of many of Azzarello’s works, highlights the great marriage between Azzarello’s writing and the art and coloring of Risso and Mulvihill, respectively. The city, through Risso’s pencils, seems stark, epic, empty, yet grand at the same time. This reflects Thomas’ daunting mission that has no end. The battle with Killer Croc in the sewers shows off the coloring talents of Mulvihill, with shadows and color used to great effect. The only bright color is the blood red that enhances the violence. The marriage of art and story definitely puts showing, rather than telling, above all. Flashbacks are used to great effect in the third and final issue, with black, white, and red solely being used by Mulvihill. Stunning use of red is utilized when Batman’s blood is pouring down from inside his mask, making it seem as if he is crying tears of blood. Tears of blood is appropriate for this story. The twist at the end of book two should not be spoiled, but the consequences of reality being replaced by pure vengeance and cold blooded reactions to life being the course of action throughout the series are realized by the characters at the end. The violence of life has been revealed to be one big bloody joke. The characters have seen the consequences of their choices and, in a scene that is a pure homage of a famous scene from “The Killing Joke”, Azzarello and the art team have fittingly expressed the tragedy of this world. Thomas has become a twisted version of Bruce’s Batman by becoming that which he has fought so hard not to become. He is alone in this world and has not only struck terror in the hearts of criminals, but has obliterated any human feeling, whether terror or joy, from his own life. Brian Azzarello, Eduardo Risso, Patricia Mulvihill, and the rest of the people involved in the creation of this book have crafted a story spun off from a line-wide DC miniseries and made it timeless and able to be enjoyed on its own without prior knowledge of what happens during “Flashpoint”.